A national state/church watchdog has sent a complaint letter to Mobile County Public Schools, Ala., over a mandatory staff event that turned into a mandatory religious service. Pastor Vint Norris from the Alabama District of the Assembly of God was invited to deliver what has been described as “a fire and brimstone invocation” at an August MCPS staff event. In response, the Freedom From Religion Foundation sent a letter asking the district to end scheduled prayer at all district meetings and events. FFRF was made aware of this event by a concerned district employee who reported that Pastor Norris’ invocation was “not merely a prayer, it was a sermon,” reporting that several employees commented that “despite being devout, this made them uncomfortable.” Multiple MCPS employees also described the religious nature of the required staff assembly on Facebook. The Constitution’s Establishment Clause, which ensures the continued separation of religion and government, mandates that the government may not in any way endorse religion. 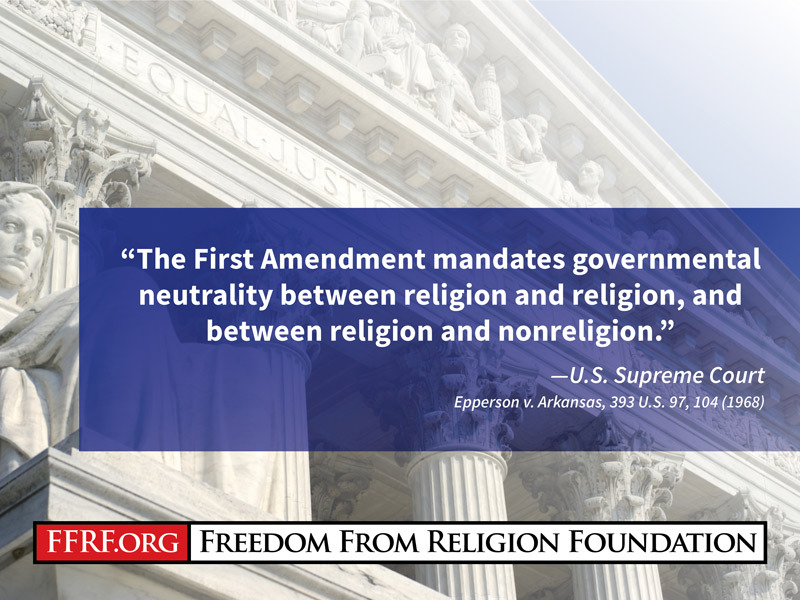 The First Amendment prohibits even the appearance of religious endorsement by government officials, FFRF noted. The occurrence of a religious sermon and the subsequent promotion of a specific set of religious values at a mandatory public school function violates these constitutional limits. FFRF is awaiting a response from MCPS’ attorney over a requested district plan to remedy the First Amendment violation and to ensure that the practice of prayer at district meeting and events will no longer occur. The Freedom From Religion Foundation is a national non-profit organization founded in 1978 with more than 32,000 members, including members in Alabama. FFRF’s purposes are to protect the separation between state and church, and to educate the public on matters related to nontheism.